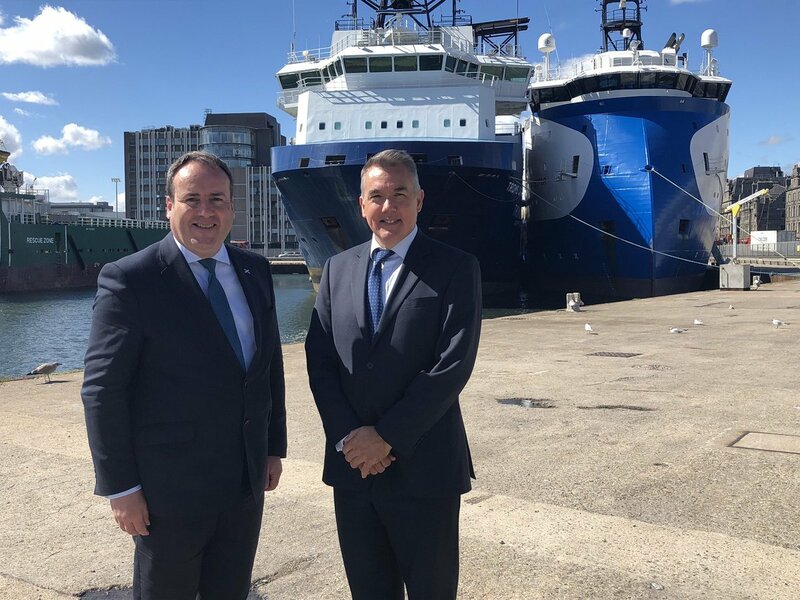 Scottish energy minister Paul Wheelhouse with newly-appointed CEO of Decom North Sea John Warrender at Aberdeen harbour. Scotland’s economy will benefit from the “legacy value” left by investments in port infrastructure, the country’s energy minister said yesterday. Paul Wheelhouse said better facilities would help the Scottish supply chain secure a bigger share of the North Sea oil and gas decommissioning market. And he said more work would follow when the time comes to remove renewable energy equipment from the sea, including wind turbines and wave power generators. Mr Wheelhouse was in Aberdeen to launch the third round of the Scottish Government’s Decommissioning Challenge Fund (DCF). First Minister Nicola Sturgeon launched the DCF in February 2017 with the intention of improving ports and supporting innovative salvage and transport methods. Grants worth £4.8 million were dished out to support various projects last year, and a further £5m will now be made available for the third round. Mr Wheelhouse acknowledged that most of the projects supported by the DCF have been onshore-based. Onshore recycling and disposal is expected to account for only a very small proportion of decommissioning expenditure. Well plugging and abandonment is the most expensive aspect. But Mr Wheelhouse insisted that it was worth using public funds to help create a supply chain which can export its expertise across the globe, and to prepare ports for renewable energy decommissioning. And he said £5m should not be viewed as a “barrier”, as the government has flexibility to go beyond that amount. Industry bodies welcomed the Scottish Government’s decision to pump another £5 million into the country’s decommissioning infrastructure. About £17 billion will be spent on UK North Sea decommissioning through to 2025 and the government wants to help the domestic supply chain take advantage. John Warrender, Decom North Sea’s new chief executive, said offshore dismantling was a “large prize” and that Scotland had to develop its capabilities. Mr Warrender said the first two rounds of funding from the Decommissioning Challenge Fund had been “highly valuable” to industry. He also expects the volume of credible applications for grants to increase as more enterprises become aware of the initiative. Mr Warrender acknowledged that a “wide range of views” exist regarding the decommissioning sector’s ability to generate employment. But he said it was worth investing appropriate amounts of money to secure work and jobs. Oil and Gas UK supply chain director Matt Abraham said: “This fresh round of funding has the potential to bolster the supply chain’s reputation and open new opportunities in emerging markets. The deadline for submitting funding applications is September 28, 2018.